A switch statement in C++ allows a variable or value of an expression to be tested for equality against a list of possible case values and when match is found, the block of code associated with that case is executed. It is similar to if..else ladder statement, but the syntax of switch statement is more readable and easy to understand. Switch case performs only equality check of the value of expression/variable against the list of case values. Case constants must be unique. We cannot write two case blocks with same constants. The expression in switch case must evaluates to return an integer, character or enumerated type. One switch statement can have maximum of one default label. Default block can be placed anywhere in switch statement. The data type of the value of expression must be same as the data type of case constants. The break statement is optional. 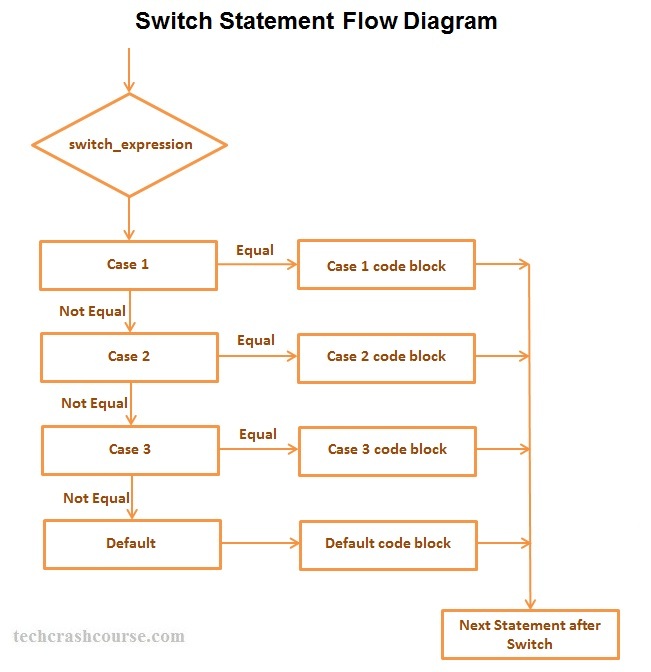 The break statement at the end of each case cause switch statement to exit. If break statement is not used, all statements below that case statement are also executed until it found a break statement. The default code block gets executed when none of the case matches with expression. default case is optional and doesn't require a break statement. The complexity of the program increases as the number of constants to compare increases. Switch statement provides a way to write easy to manage and readable code. Switch statement provides a default case handler when no case matches. We can nest switch statements like if else statements. The syntax of switch case is easy to understand and more readable. Switch statements can only be used to perform equality comparison, we cannot perform conditional checks using relational or logical operators like >, <, >==, &&, || etc.